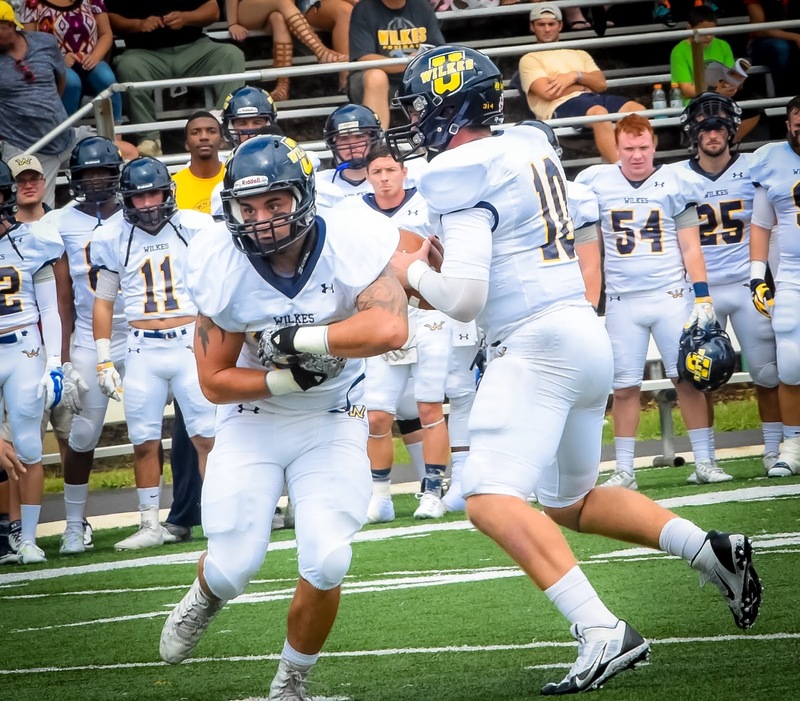 Wilkes University is coming off of a 31-14 loss against Stevenson University last Saturday on Senior Day. Misericordia is still looking for its first win of 2015 after falling 40-38 last week at FDU-Florham. Mark Ross (Penn State ‘90) is in his fourth season as head football coach at Misericordia University. A native of Athens, PA, Ross was hired as the first coach in the history of the program in February, 2011. A year ago, he guided the Cougars to their first home win, a 35-0 shutout over FDU-Florham. Ross spent the previous 10 seasons as an assistant coach at Ithaca College and has also coached at East Stroudsburg University. At Ithaca, he served as the Bombers’ defensive coordinator and linebackers coach for the Bombers since 2007 and previously coached linebackers, defensive line and place-kickers. A graduate of Penn State with a degree in secondary education, Ross spent four seasons as an assistant coach at East Stroudsburg, where he earned a master’s in sport management. This will be the fourth meeting between the two schools, with Wilkes holding a 3-0 advantage in the series. The Colonels defeated the Cougars 41-7 at Schmidt Stadium in last season’s meeting. The Colonels will close out its 2015 campaign with a trip to cross-town rival King’s College for the 20th annual Mayor’s Cup game. Wilkes holds a 20-7 lead in the overall series between the teams. The Colonels also hold a 13-5 lead in Mayor’s Cup games since the teams began playing for the cup in 1996. The Mayor’s Cup tradition began with former Wilkes-Barre Mayor Thomas McGroarty and has remained intact through today with current Mayor Thomas Leighton, a 1982 King’s graduate, presiding. • Wilkes is tenth in the MAC in scoring offense (14.5), seventh in total offense (334.6), tenth in rushing offense (81.9) and second in passing offense (252.8). • Ryan Dailey finished 33-of-52 for 305 yards, his seventh time topping 220+ yards in his last eight games. • Dailey’ currently stands fifth on the school’s all-time passing list with 4,187 career yards and only 417 yards away from Jeff Marshman ‘01 (4,604) for fourth on the list. Dailey ranks first in the MAC in passing yards per-game with 251.0 while standing tops in the league in attempts (353) and completions (215). His ten touchdown passes rank third in the league, while his 60.9 completion percentage ranks second. • PJ Incremona leads the Colonels ground attack standing sixth in the league with an average of 60.7 yards per game. William Deemer, the team’s top receiver, ranks seventh in the league with 44 receptions, and is ninth in the MAC with an average of 52.6 yards per game. Aaron Coyne has scored five touchdowns ranking sixth in the MAC for all receivers. • Wilkes is tenth in the MAC in scoring defense (35.9), ninth in total defense (419), sixth in rushing defense (174.8) and ninth in passing defense (244.3). • Linebacker Tanner Stengel leads the league with 12.4 tackles per game and ranks third with 12.0 tackles-for-loss. Isaiah Robinson and Jared Powell pace the secondary, as Robinson has 54 tackles, 5.0 for loss, two pass breakups, and one interception, while Powell has 49 stops, 1.0 for loss, eight breakups, and one interception. • Misericordia ranks ninth in the MAC in scoring offense (16.3), ninth in total offense (305.9), fourth in rushing offense (164.4) and ninth in passing offense (141.5). • The ground game is led by quarterback Jeff Puckett, who ranks second in the MAC with 94.6 yards per game and ranks third with seven touchdowns. • Puckett has thrown for 1,107 yards on 100-for-205 passing including ten touchdowns and ten interceptions. His primary target has been Mark McMaster who has hauled in 26 receptions for 271 yards and one score. • Misericordia ranks ninth in the MAC in scoring defense (35.5), tenth in total defense (443), tenth in rushing defense (232.1) and seventh in passing defense (210.9). • Tyler Collins has paced the Cougar defense, as he is tops on the team with 54 total tackles including 35 solo stops. He also has claimed 5.5 tackles-for-loss on the season, 1.0 sacks, three pass breakups and one forced fumble.